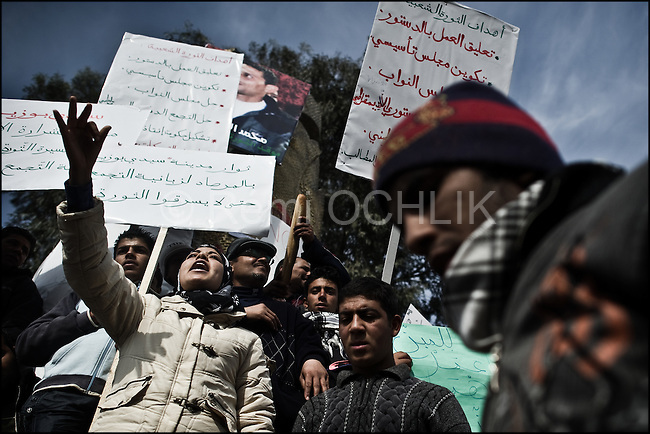 © Remi OCHLIK/IP3 - Sidi Bouzid Tunisia the 20 january 2011 - Sidi Bouzid resdidents demonstrate in front of In front of government building where Mohamed set him on fire ...When Mohamed Bouazizi set himself alight on Dec. 17, he sparked flames far greater than the ones that would ultimately kill him. The Tunisian man, an unemployed college graduate with children to feed, had tried finding work hawking vegetables, but was thwarted by police, who confiscated his cart. So in a grisly act of protest and anguish, Bouazizi doused himself in gasoline and set himself ablaze...The act of self-immolation not only triggered the current political crisis in Tunisia, which ousted the president Jan. 14 and has led to a complicated political impasse. It also inspired copycat self-immolations across North Africa, who attempted this very sensational form of suicide as statements of their own desperation and frustration with the authoritarian regimes in their countries. The latest count of protesters who have set themselves on fire in North Africa is up to eight, with four in Algeria, two in Egypt and one in Mauritania, as well as Bouazizi's act in Tunisia.